Just like a sign on your building, you need a site to convey basic information to current and potential customers. We make it easy for you to communicate your basic information with our affordable Paso Robles web design service. You don’t need to sell anything online to be successful with your online marketing. The goal of a basic business website is to convert browsers into buyers and have them call or walk in the door. Our basic website development package starts is very affordabe. It’s a perfect fit for any small business. It includes an interview, analysis, keywords, copy writing, graphic design, and search engine optimization. Your website will help get your business found on the web. 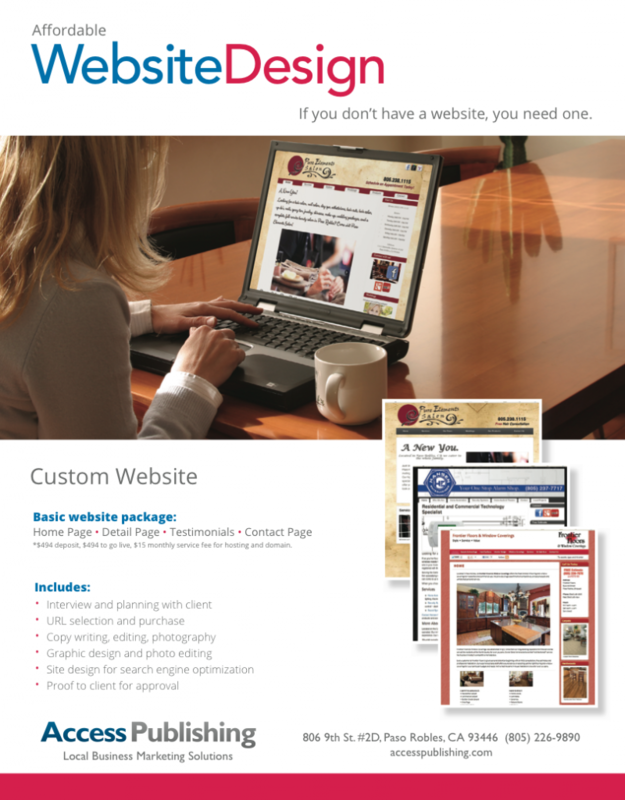 We are experts in small business web design in Paso Robles and all of San Luis Obispo County. The most effective way to keep your site noticed online is fresh content. It’s the most powerful form of SEO on the Internet. Or maybe you just need someone to make changes to your website. We can do it all. Ongoing writing, editing, design and consultation is available by the hour. Take a look at samples by our web designers.